Whether fall is officially here or not I think anytime is a good time for some hearty, tasty soup! And this soup is so darn easy that my 6-year-old practically made it by herself (with close supervision of course). All I had to do was chop an onion and garlic…oh and buy the ingredients and help her read the recipe, but she pretty much did the rest. So the point is if a child can make this soup then so can you. :) And the best way to get your own child to possibly eat this pea green soup is to get them involved in making it with you. I suppose topping the soup off with chopped hot dogs or bacon might help lure them in as well. My other daughter, who is the pickier one, didn’t dig right into this soup like I had hoped. But as soon as she saw the bacon (which is her fav!) floating in there she ate a decent sized portion of the soup, which made me happy. So without further ado here it is! Adapted from Emeril Lagasse. This recipe serves 8, but there will also be enough to freeze some leftovers! Add the onions and season with salt and pepper. Once the onions have softened add the garlic, bay leaf, split peas and cook, stirring, for 1 minute. Add the broth/stock and bring to a boil, then reduce the heat to medium-low. Simmer and stir occasionally for 45 minutes or until the peas are tender. 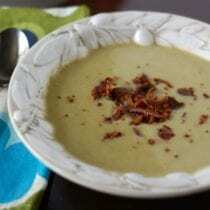 Remove soup pot from heat, discard the bay leaf, and puree using a hand-held immersion blender. The soup may be pureed in batches in a freestanding blender as well. Stir in the milk and hot sauce (if desired) and ladle warm soup into bowls. Add your favorite topping and enjoy! This sounds delicious – thanks for sharing! I’ve never added milk to my split pea soup. It sounds like it would be really creamy and yummy. Thanks for the idea! The soup sounds delicious but I wish you would rethink considering processed meats like hotdogs and bacon as real foods. Organic or not, they are correlated with increased cancer risk. Our mission is to avoid “highly” processed foods (cooking is even a form of “processing” food) and we feel if hotdogs and bacon are humanely raised and local they are okay in moderation. We only buy uncured bacon from a local farm and we only occasionally buy hot dogs (once every few months), and when we do they are either the Applegate organic grass-fed beef dogs or from a local farm as well. Awesome recipe! We love soup in this house. I also have been wondering what bacon or hot dog is considered not processed? Do you have specific brands that are all natural or not processed? I can’t speak to hot dogs, as I’ve never heard of a healthy un-processed hotdog, but bacon can be. Though it is hard to find. Basically, bacon is just pork belly that has been cured (in salt) and smoked then thinly sliced. If it’s done in the traditional way, it’s no more processed than salt fish, jerky or flour. Of course, the hard part is finding bacon that has been naturally cured and smoked. I’m sorry, I can’t help you there. I’m in canada and I get my bacon from my family, who raises their own meat. I guess the trick would be to check out the ingredients. If there is more than pork, salt and the wood smoke listed than it’s probably factory processed. Hopefully someone will have a lead on a good product that’s available commercially. We only buy uncured bacon…thanks for sharing your insight! We buy local, uncured bacon from a farm that raises their animals in a humane manner. We only buy hot dogs once every few months (my 4-year-old loves them) and when we do they are either Applegate organic grass-fed dogs or from a local farm as well. Cooking your food is technically a form of “processing” it so we just try to find the least processed meats possible. I hope that helps! Sounds really yummy! Can’t wait to get the ingredients and try it. ok i apologize in advance if this is a stupid question but do you buy the split peas already dried out or are you suppose to dry them out yourself? Are they in the bulk food bins? It’s not a stupid question. I’m sure lots of people aren’t familiar with split peas, you’ve probably only ever heard of fresh peas. Split peas are purchased dried. They’re usually found in the same section of the grocery store where you find the dried beans and lentils. There are no stupid questions on this site! :) The peas are already dried when you buy them. They are available either in bulk or a pre-packaged bag. We have made this recipe for years and usually after Christmas or Easter when we have cooked ham, we use chunks of cooked ham and it’s really good. I’m not avbig pork eater, but this is good. can you use the yellow split peas? I don’t know much about split peas but I thought I had some but they are more yellow. Can I use them for this soup. If so I will be able to make it here in Ethiopia! Thanks! I think that would work just fine…I know you can sometimes only find different ingredients in different places. Good luck! Can something else be substituted for the milk? The doc just labeled me as lactose intolerant today and I am frantically wondering about substitutions in all of my favorite budget-friendly recipes!!! You could omit the milk or try almond milk instead. Good luck! Does this soup freeze well? My husband won’t touch split pea soup (doesn’t know what he’s missing). Yes…it would be great defrosted out of the freezer! Great recipe! We had this tonight and everyone loved it! Do you soak the split peas over night? I attempted to make split pea soup once in the crockpot and the peas NEVER softened! I had to dump the whole pot out. :( This recipe sounds delicious! No, you don’t have to soak them and it works great. I always forget to soak beans and things overnight, which is why I love this recipe! What does it mean to “picked over” the dried green split peas??? There are often small pebbles or stones in bags of peas and beans – just a fact of harvesting them – so you want to pick them over to find any strays. Most get sorted out before they ever get bagged, but it’s always worth looking them over yourself first. It’s not fun biting into a missed pebble. Just make sure no stones are in the mix by accident! I ate this every day for a week after you posted this recipe. I never ate split pea soup and I thought it was wonderful. For the “hot sauce” I used Sriracha hot sauce (aka rooster sauce) to give it some zing!! awesome!! 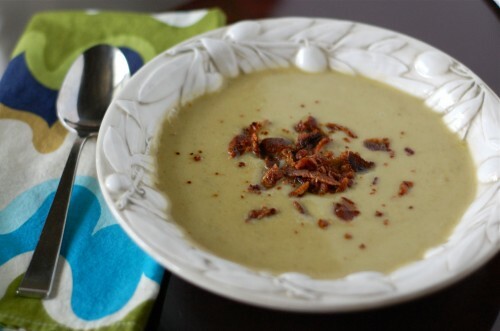 I’m making this soup tonight…looks delish. I had my hubby run out and get the ingredients for me, and he got yellow split peas instead….will these work, or do I need to get the green ones? Thanks! I made this for dinner last night at it was a hit! My son wasn’t sure about it at first, but he eventually ate the whole bowl. We were running low on milk so instead we added a spoonful of sour cream along with our bacon topping. It was great that way! Made this super yummy soup tonight for dinner, with whole wheat biscuits on the side. It was SO GOOD! I added some potato and carrots and omitted the milk, I will be making this again for sure. Another winner, in my book!! Thank you! Looks yummy! Is it necessary to puree the soup? Can you leave it chunky? It won’t have a creamy consistency if you don’t puree it, but it would surely still taste good. Give it a shot! Hi there, You’ve done a fantastic job. I will definitely digg it and individually suggest to my friends. I am sure they’ll be benefited from this site. I love making meals in the crockpot. Do you have a crockpot version of this recipe. It looks delicious. absolutely delicious. and easy. loved it. Made this soup tonight with the homemade chicken stock that I made from the chicken in a crock pot recipe! It was easy, delicious, and I have to say I’m so proud of following it through and making the whole thing from real food. I think it tasted even better knowing that! Thank you so much for all the work you put into this website! It’s our main resource and motivation for my family’s transition to real food. Just made this tonight for dinner. It is AMAZING!!! I have had a lot of bad split pea soups but this one is delicious! My kids even ate it. I made it with the chicken stock recipe from this website and served this soup with ham on top and with the cheddar and buttermilk biscuits on the side.. I even forgot to put the milk in the soup and it was still great. My 4 and 5 year old ate it up! Thanks for all of your recipes! I have been living off of this site for the past month! Love it! I LOVE split pea soup from my younger days when mom used to make it from a ham bone. I made this from the homemade chicken stock today. I haven’t even gotten to the part where you puree it as it is so good just as is! YUM! Wondering what the nutrition is on this. I make split pea soup all the time and my soup is so popular that people request it at work. It never lasts. I never add milk and I don’t puree it either…I do add some oregano, celery and carrots and always make it with any left over pork. I also will make it with bacon or hamhocks. It is so good that once when I made it I put some in a paper cup and sent my kids outside with it only to have them return with about 10 more requests from neighborhood kids who have never tried it before and a stranger who happened to comment on how good the soup looked as he was walking by all the kids eating it was offered a cup and he couldn’t stop complimenting me on it so I gave him the recipe to take home so his wife could make it to. I always make a huge pot of it so I like to add a couple extra bayleaf to mine. It’s a great hearty soup on these chilly winter nights…full of iron too! Julie, Can you please provide your recipe for the Split Pea Soup? Julie, can you please provide your recipe for the split pea soup? Thank you. Would love your recipe! Please share! Would love the recipe also! I adapted this recipe for slow cooking since I’ve done many soups (including split pea) with it. so no troubles there. I tripled the garlic and added some curry ingredients to kick it up a notch because that’s how I role. Also, I omitted the milk. it’s not needed to achieve a desirable thick consistency in pea or bean soups. Very good basic recipe. nice. I use lots of onions and carrots and so have lots of peels and trimmings. Add those to celery trimmings and maybe an extra rib or two), and a few herbs, and boil it all in pasta or potato water, and presto! instant veggie stock. I always put in a couple smashed cloves of garlic and a couple bay leaves and dill, but use whatever herbs you like or will go with the dish you’re using the stock in. Sometimes I will add green bean ends and sometimes tomato bits, etc. Just don’t use trimmings from the cabbage family and no fennel. I’ll save all the trimmings and then on Saturday, do the boiling and I have anywhere from 4-6 cups of stock to use during the next week. This kind of veggie stock is really good for bean soups (including split pea!) and others where the broth isn’t a major flavor. We have made this recipe quite a few times because it is easy and so delicious. My husband even says no to the toppings. It is all about the peas! This time I made the biscuits that you have linked. They were so good and super easy! I will definitely make both of these recipes again soon. Your site is terrific! Yes, you can freeze it. The texture changes a little.